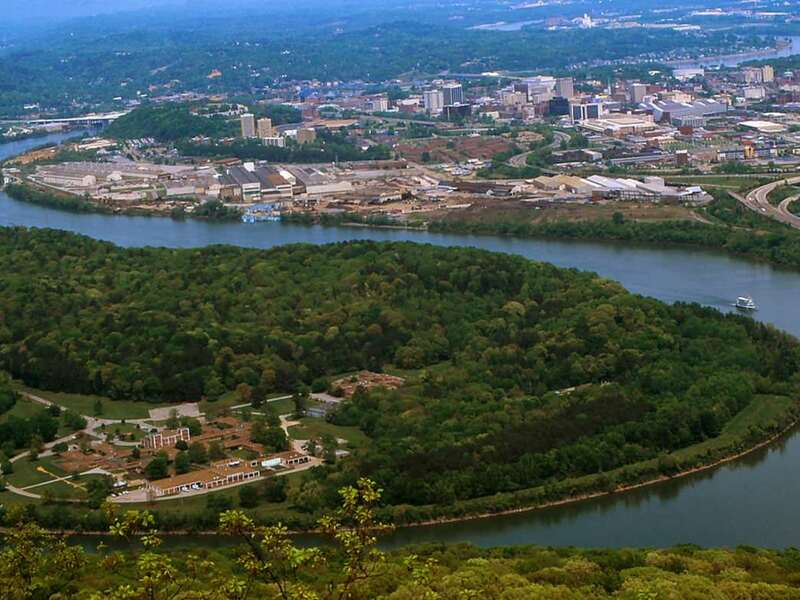 Thousands upon thousands (upon thousands) of years ago, the fertile floodplain of Chattanooga's Moccasin Bend was home to some of America's earliest-known inhabitants. To put this enormous timespan in quite marginal and condensed perspective: when the wheel was invented, Paleo-Indians were roaming the Bend. When the Egyptian pyramids were being constructed, Archaic Indians were hunting white-tailed deer and foraging hickory nuts along the flanks of Stringers Ridge. When Alexander the Great was driving into the heart of Persia, and the Roman Empire was rising and then falling 500 years later, Woodland Indians were fishing the waters of the Tennessee River and burying their loved and lost ones in traditional mounds along the southernmost edge of the Moccasin Bend peninsula. And comparatively recently, when Western European Christians were waging war in the Middle East during the Crusades, and Marco Polo was traveling the Silk Road into the open expanses of China and Mongolia, and Columbus and countless other Spanish explorers behind him were sailing the ocean blue and establishing silver as the ever-shrinking world's currency, Mississippian Indians were establishing hierarchical chiefdom systems and planting beans, maize, and squash at the Bend beneath Lookout Mountain. Fast forward 12,000 years, from when the earliest of these Natives first hunted and gathered here, and this once-sacred cradle of Native American civilization is now home to a rather farcical bag of tricks. Today, an 18-hole municipal golf course sits on the fields that were once so ripe with corn and squash. A police firing range rests on the eastern bank. A psychiatric ward lies directly on top of the site of sacred burial mounds. And perhaps most amusing (or depressing) of all: a waste management facility has now become quite possibly the most infamous association with the Bend, as its odorous fumes can be smelled from hundreds of yards away. Yet amazingly, surrounding these comically eclectic little pockets of fragmented property lies roughly 1,000 acres of public land that has been inducted into the national park system. While technically, Moccasin Bend is a National Archaeological District, and not a national park, this title is apparently pretty arbitrary. At the time when the Department of the Interior was considering the case of Moccasin Bend, there was a moratorium on creating new national park units. So in 2003, to get around this bureaucratic technicality, the powers at be settled upon the title of "National Archaeological District"—the first and only of its kind. For all intents and purposes of this story, however, let's consider Moccasin Bend a national park—it is after all a unit of the Chickamauga and Chattanooga National Military Park. 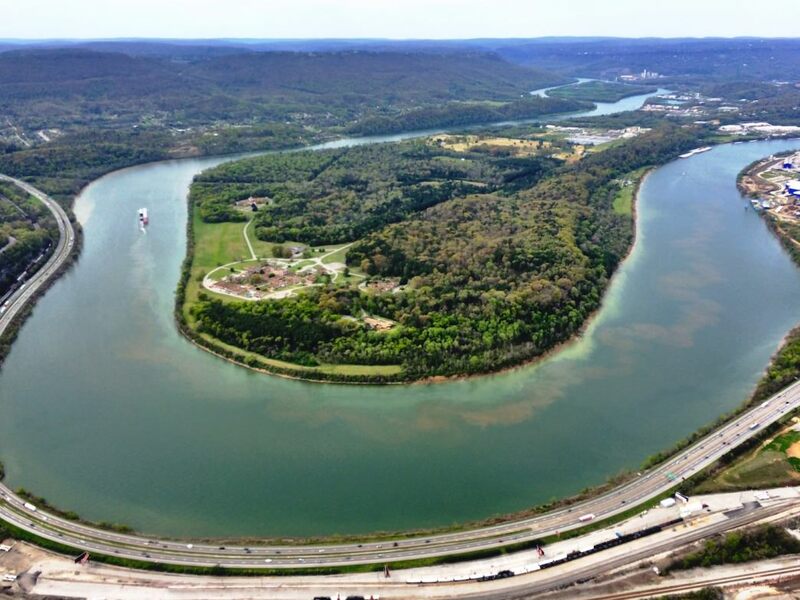 In fact, rather accurately and amusingly, Michael Wurzel, the Executive Director of Friends of Moccasin Bend, describes Moccasin Bend as the, "Humpty Dumpty of national parks," citing the peculiar manner in which this peninsula has been dissected. "We're just trying to put it back together again." But how did it come to this? How did this once so culturally and anthropologically significant area become such a curiously muddled pie? To gain insight, we'll have to have another little history lesson. When Europeans arrived in the 1500's, and Spanish conquistadors like Hernando De Soto and Tristan de Luna ventured from the coast of Florida into the hinterlands of unknown America in search of gold, the fate of Moccasin Bend (and of course, many other locales) was immediately, and forever, altered. For the next century or so, Cherokee-European relations were frictional to say the least. Time and again, the Cherokee Nation was forced to cede more and more land west of the Appalachians, until eventually, as we all know, they were forcibly removed as part of the Indian Removal Act of 1830. Not until 1838, however, did Moccasin Bend witness its first glimpse of the Trail of Tears, when many of the Cherokee who had been held in a nearby Chattanooga internment camp were ushered westward along the Federal Road that directly dissected the Bend. Following this eviction, white landowners immediately swooped upon the vacant property, divvying it up into clusters of private land and peaceably farming it for the next 20 years or so—until, that is, a little something called the American Civil War came along and ultimately decided that the river and railroad town of Chattanooga was a place of strategic significance. The southern point of the Bend—the same site of the ancient mound complexes and the present day psychiatric ward—proved especially significant. During the Union siege of Lookout Mountain, Federal officers stationed covering artillery fire on this bank, constantly barraging the slope of Lookout Mountain and the Confederate-occupied Cravens House along with it. 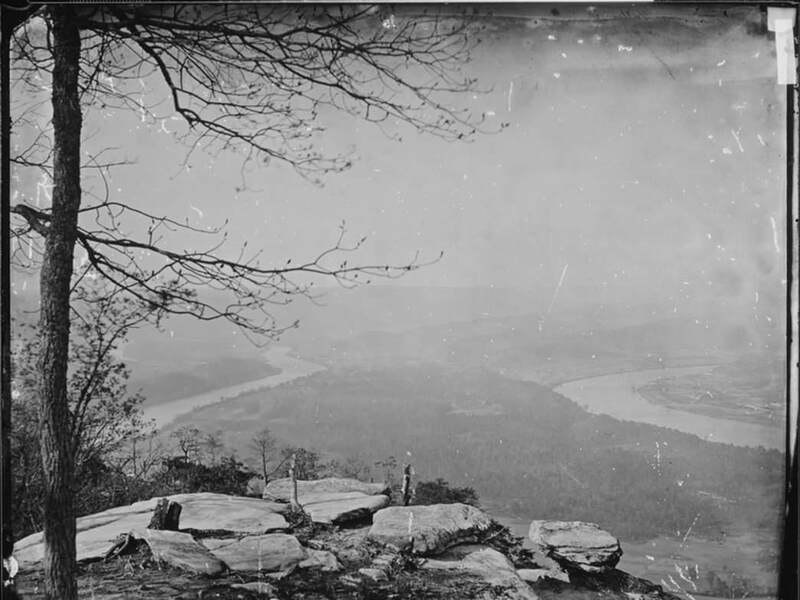 Then on a gray November morning in 1863, this covering fire allowed foot soldiers on the opposite side of the river to cross Lookout Creek, travel through what is now Reflection Riding, and then eventually scale the northwestern flank of Lookout Mountain, taking control of it by the end of the day. After the war, the first debates about what should become of the Bend began to surface. An ideological chasm, perhaps typical of the turn of the 20th century, was beginning to form. Would the Bend become a site for industrial development in order to maintain pace with the progressive times? Or would it become a protected park, designed to preserve the area's natural and human heritage? Just when the latter argument seemed to be gathering steam in the late 1920's, the Great Depression struck, followed soon after by World War II, and suddenly, all of the peachy plans for a "park and pleasure resort" were given a hard knock dose of neglectful reality. Following World War II, despite a long drawn-out and passionate discourse, the stage was ultimately set for an enterprise agenda. Even though preservationists came achingly close—within a day in fact in 1952—to receiving funds and support from local city officials for a memorial park, it's perhaps not unfair to say that they were always facing a losing battle. As we've learned, history wasn't always kind to the Bend's original inhabitants and their descendants. Ravaged first by disease, then by hundreds of years of misunderstanding and degradation, and finally by their removal, it was unlikely that the preservation of their memory would be of top shelf importance either. And so, the period from the 1950's to the late 1980's can generally be characterized as a bureaucratic back and forth—or perhaps more accurately, as a "one foot forward, two steps back" sort of scenario for the preservationists at least. In 1947, the police firing range was built. In the late 1950's, the WDEF Radio Towers went up. In 1961, the first unit of the Mental Hospital was constructed. In the same year, the waste management treatment facility was developed, effectively changing the odorscape of the area for the next 50 years. In 1964, to allow more room for barges to round the contour of the Bend, the Baner Dredging Company cut a strip off the southern 'toe' of the moccasin and consequently pumped tons of ancient Indian artifacts and human remains through underground pipes into the heart of the Bend. And in 1966, the 18-hole municipal golf course was opened to the public. For the next thirty years, nothing terribly significant happened. (Other than countless acts of unfortunate vandalism and relic hunting, of course.) But aside from _that, _nothing too drastic occurred—good or bad. Debates wore on. But ultimately, no massive industrial sites were erected. No national park status granted. Moccasin Bend simply existed in this weird world that had been created for it, gradually settling into its unconventional identity—one that mixed 10,000 years of human history with roughly 100 years of dubious decision-making. Then, in 1994, a new group called the Friends of Moccasin Bend arrived on the scene just as the City of Chattanooga was beginning its now well-documented renaissance. 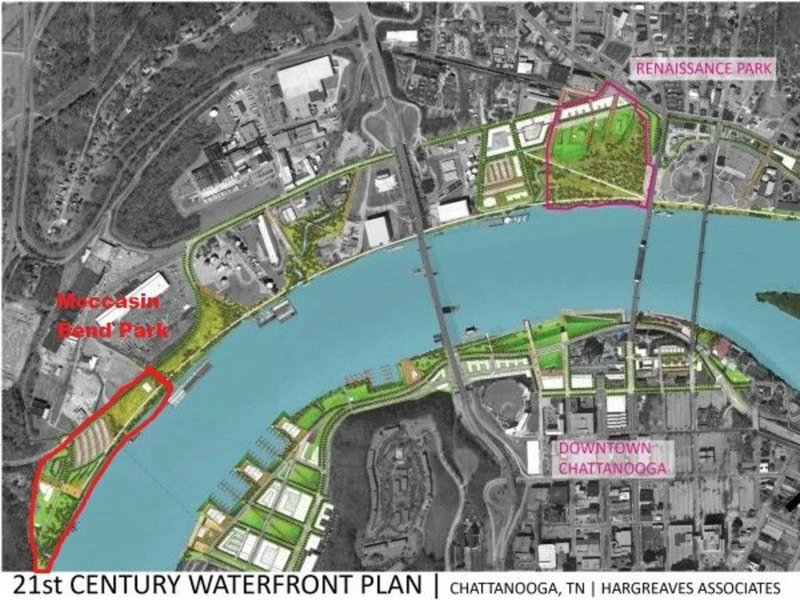 Somewhat piggybacking off the momentum of this renaissance, the Friends of the Bend received a few grants and revived their proposal for the Bend to become part of the Chickamauga and Chattanooga National Military Park. In 2003, their efforts paid off, as the National Archaeological District was inducted as a unit of the military park. After a long and bumpy ride, Moccasin Bend had finally become a national park (even if it was somewhat Humpty Dumpty-ish in nature). Today, the Bend is a place that's teeming with recreationists. Cyclists and road runners enjoy heading out on the flat, low-trafficked asphalt roads towards the mental hospital and back. Hikers and trail runners head to the pine-laden and swampy Blue Blazes Trail . And even the staunchest birdie-seeking golfers will look up from the tee box once in a while to marvel at the unique angle of Lookout Mountain stretching off into the distance, or to watch the fearless packs of deer and turkey that frequent the fairway. But despite such enthusiastic recreational use, there's still much to be done. For as much as locals appreciate the area, there are still relatively few ways to enjoy it. With only two trails (a 3-mile loop along the Blue Blazes Trail and a .7-mile out and back to the Brown's Ferry site), it's safe to say visitors won't be flocking from far and wide to come see the park. Then there's the whole matter of much of the Bend's more historical sites being cut off by properties like the firing range and mental hospital. And finally, even getting to the Bend is somewhat of a nightmare. The industrial streetscape along Manufacturers and Hamm Roads leading out to the Bend is unsightly to say the least, and it leaves the park somewhat isolated from the Northshore and Downtown districts. The Friends of Moccasin Bend are hard at work with local city officials and park services addressing all of these problems. Additionally, though there have been a few hiccups of late, the plans to phase out the use of the firing range and mental hospital are also in the works. And perhaps most encouraging, the two year General Management Plan Amendment (GMPA) process for the Bend has officially begun, with community meetings and visioning events already underway. This process will provide the National Park Service and the Friends with a blueprint for future park amenities such as a visitor center, parking areas, roads, trails, boat ramps, and interpretive experiences. 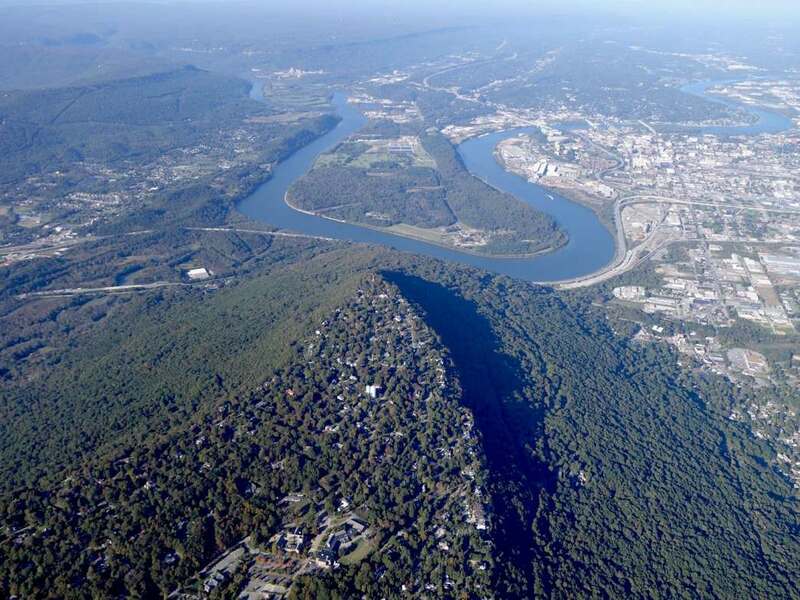 With the GMPA underway, Moccasin Bend can finally realize its potential as a park rather than simply a protected area. Hopefully, in the next few years, and for years to come, all the king's horses and all the king's men of Chattanooga can come together and put Moccasin Bend back together again. It's probably what it deserves. 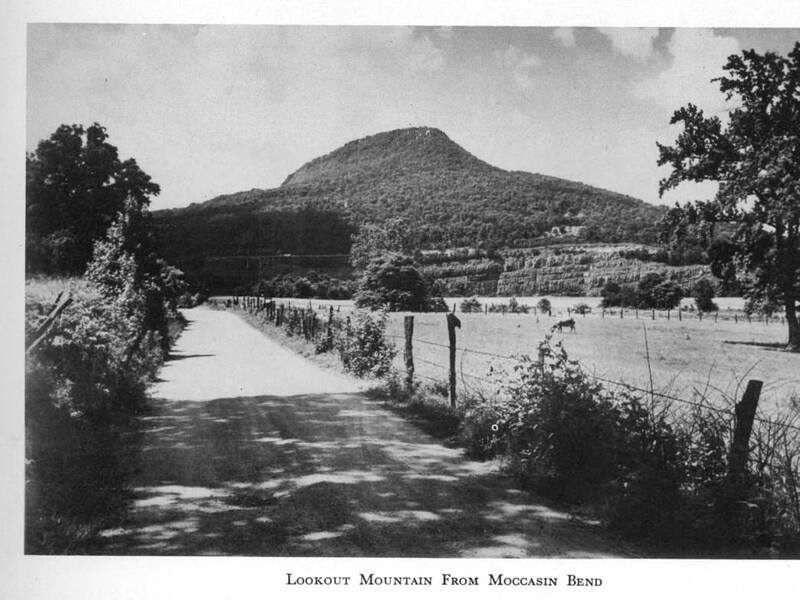 For a fascinating and much less truncated read, the National Park Service's Moccasin Bend Cultural Landscape Report, from which I pulled much of the factual information within this report, is a wonderful resource.